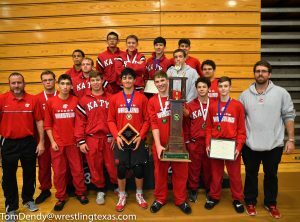 Katy High School wins the Boys and Girls division at The Woodlands Invite. Arlington Martin wins the Rumble at the Rock. Weatherford wins the Boys and the Girls division as well at the Capital Classic. Girls actually outscored the 2nd place Boys team Vandegrift. South Grand Prairie wins their tournament, Lake Highlands wins their Tri Classic. San Antonio Reagan wins the Charger Classic. La Joya Juarez-Lincoln wins their tournament by 4 points over Weslaco. Prosper wins the American Wrestler Heritage Invite. #3 Donavan Whitted of Arlington Martin won by decision over #6 Christian Lopez of Houston Westside 5-0. #7 Jackson Crandall of Katy wins the Woodland Invite. #4 Diego Serna of Mission Sharyland Pioneer wins the Rattler Invite. #1 @ 106 Parker Decker of Keller bumped up to 113 where he faced off with #3 Dominic Chavez of Arlington Martin in the finals. Chavez won by a 1-0 decision. #6 Isaiah Calderon stays ahead of #8 Kynnyth Maban of Oak Ridge with a 6-0 finals decision. #2 @ 113 Jordan Strmiska of Lake Travis moves up to 120 with #5 Noah Gochberg of Vandegrift. John Geiger of Leander beat Gochberg in the quarter finals by a major decision 12-1. Strmiska beats Geiger by a 6-4 decision in the finals. #1 @113 Preston Decker of Keller moves up and #4 @ 126 Luke Garcia moves down, this finals battle went to Garcia by a 3-0 decision. 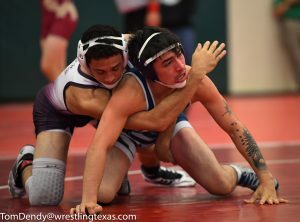 #10 @ 113 Daniel Hernandez of Houston Westside gets by #7 @ 120 Jaden Two Lance of Arlington Martin 2-0. #7 Austin Hernandez of Cy Ranch redeems a earlier season loss to #6 Brandon Diaz of Katy in the semi finals and goes on to win the Woodlands Invite. #2 Conner Manderfeld of Arlington Martin stays ahead of #5 Chase Howerton of Rockwall with a 8-2 Decision. #[email protected] Luke Sloan of Vandegrift gets beat by NR Freshman DeShawn Cosby of Schertz Clemens in OT, who goes on to win the Capital Classic Tournament. #6 Garrett Orlando of Cy Fair cruises to a Woodlands finals win. #1 ranked Heath Roth stays unbeaten at the Liberty duals. #[email protected] Tyler Barker of McNeil wins Capital Classic. #8 Sabastian Jackson of Cy Fair avenges an earlier loss to #7 Gabriel Palos of Cy Ridge in the Woodlands finals by a 4-2 decision. #1 Michael Kumlien of Northwest wins the American Wrestler. #[email protected] Daniel Leal of Corpus Christi Veterans Memorial stays un beaten at the Rattler. #6 Carson Lipsey of Rockwall loses to #10 Austin Cooley of Plano in the semi finals who loses to #11 Brett Taylor of Arlington Martin. #15 Truman Timmons of Katy pins his way to a Woodlands championships. #6 Anthony Martinez of Mayde Creek beats #5 Baylee Walker of Klein in the Cy Ridge finals a couple weeks ago and #2 Ryan Ierubino of Clear Lake at Big Horn Duals. #1 @ 145 Daniel Manibog moves up, so he will be at the top spot and has no problem winning the Woodlands Invite. #3 @ 145 Erik Pacheco of Carter Riverside moves up and wins the American Wrestler. #3 Eric Two Lance of Arlington Martin stays ahead of #4 Kade McMahon of Rockwall with a finals decision 11-4. #14 Zane Heck of Weatherford wins the Capital Classic. #1 Tommy Flaherty of Prosper sweeps at the American Wrestler. #3 @ 182 Nathan Alvarez of San Antonio Roosevelt beats #5 @182 Jeremiah Hatfield in the finals of the Capital Classic. #3 Adam Kilgore of Arlington Bowie wins the Rumble at the Rock. #2 Kyle Kretzer doesnt get out of the 1st period in all his matches for a finals win at the Woodlands Invite. #3 @ 145 Aiden Jean of Northwest moves up 3 weight classes and beats #4 James Wujek of Prosper . #2 @ 170 Luke Carlin of Georgetown loses to#4 @ 195 Clayton Jetton of Dripping Spriings who drops a weight in the Capital Classic a finals 4-3 decision. Unranked Kelby Davis wins the Capital Classic. #7 Josh Wilson of Cy Fair beats #3 Jarod Camacho of Cy Ranch in the Woodlands finals by forfeit. #8 Randall Pulido of Westlake wins the Capital Classic. #5 Sean Delmonte of Rockwall beats #1 @220-5A Geronimo Saucedo of Wylie East. #3 Timmy Dendy of Cy Woods wins his bracket at the Woodlands. #6 George Marsh of New Braunfels stays undefeated win a championship win at the Rumble at the Rock. #5 Tristan Baugher of Prosper stays undefeated at the American Wrestler.